Ever since tasting the delectable wild boar filet steaks on a bed of potatoes at Puerta Osario Restrobar in Seville, DonQui was determined to try to reproduce it at home. The Aldeburgh food and drink festival gave him the opportunity to purchase a couple of wild boar filet steaks and now he was ready to experiment. 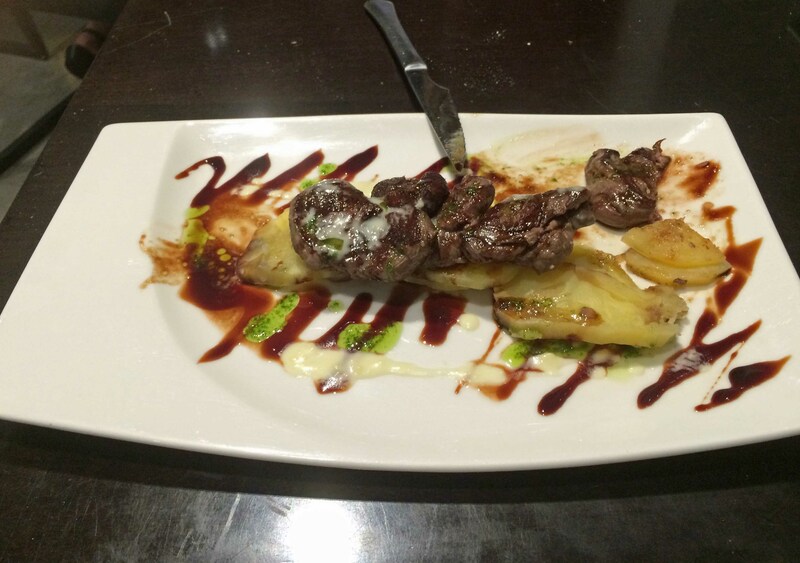 He remembered a few things from the meal at Puerta Osario Restrobar. Firstly that the steaks were coated with something that reminded him of balsamic vinegar. As they had been topped off with a balsamic glaze and a pesto dressing he thought that a wine and balsamic vinegar glaze might just work. The second memory was of the delicious slice potatoes which seemed to be neither fried nor boiled. He decided to try a combination of both. After searching on line he thought that a slight modification of the recipe for patatas pimenton con ajillo might just be the answer. 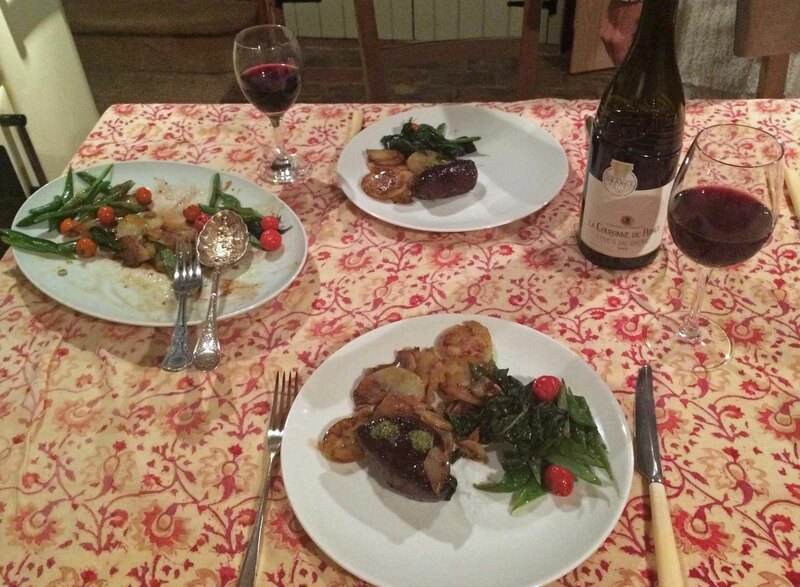 So here is DonQui’s own invented recipe for Spanish style wild boar filets. Recognising the difficulty of obtaining wild boar filet steaks DonQui suggests beef filet mignon as a more than acceptable substitute. Farmed boar will not work as it tastes more like pork. 2 medium sized potatoes of a firm waxy variety such as Charlotte. Floury potatoes will not work as they will simply fall apart. 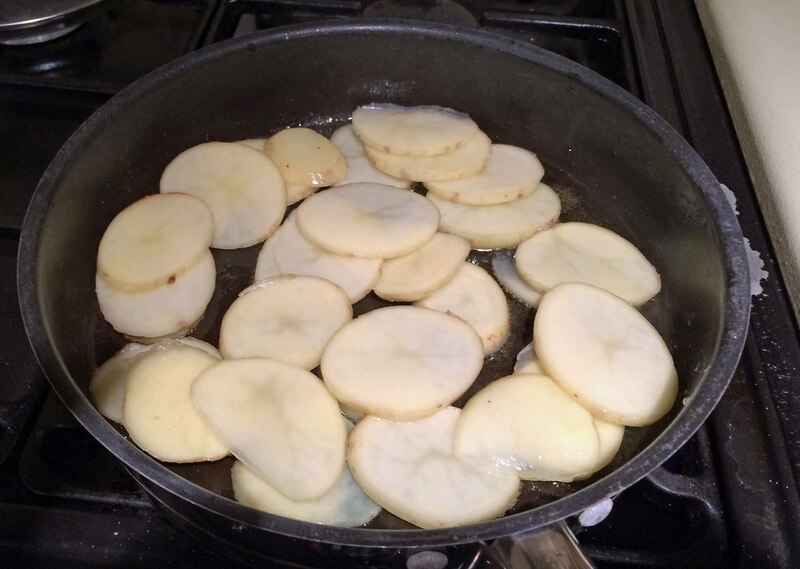 Scrape and slice the potatoes, putting the slices in a bowl of lightly salted water (optional but recommended if you don’t start cooking right away). The soaking also helps to remove starch. Drain and dry. 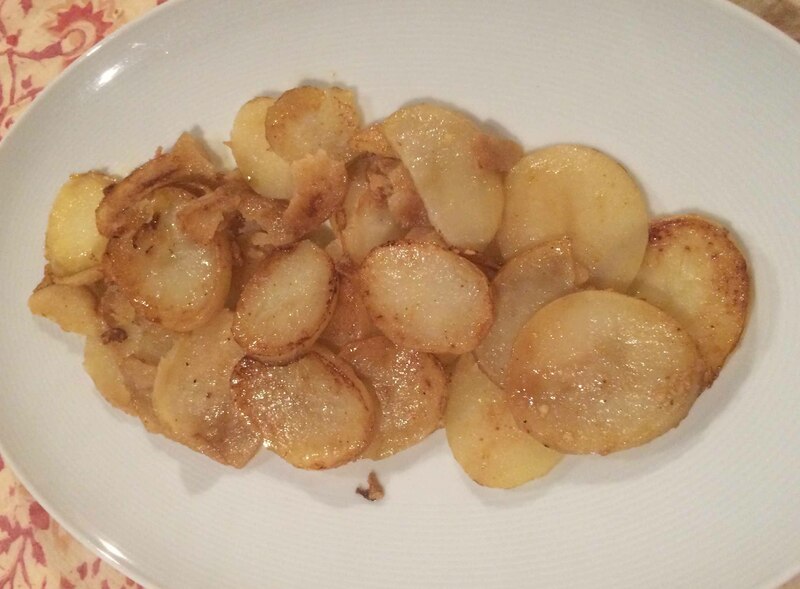 Heat the olive oil in a pan and gently fry the potato slices. After a minute or so put a lid on the pan and let them simmer gently for about another 7 minutes. 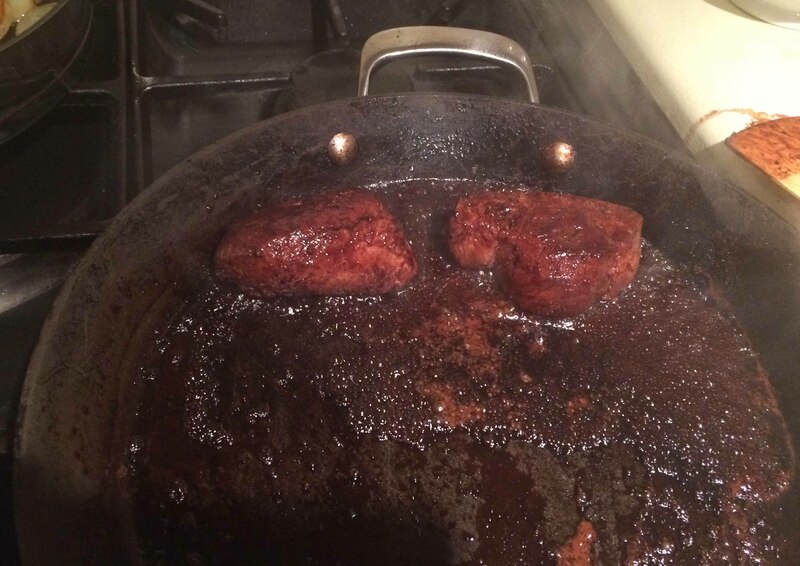 At this point they should be partially cooked and not too browned. Take out of the pan and set aside. Crush the garlic clove and mix with the paprika. Then dissolve the bouillon cube in a small amount of hot water and set both aside. Take the steaks out of the fridge at least 45 mins before cooking and let them come to room temperature. 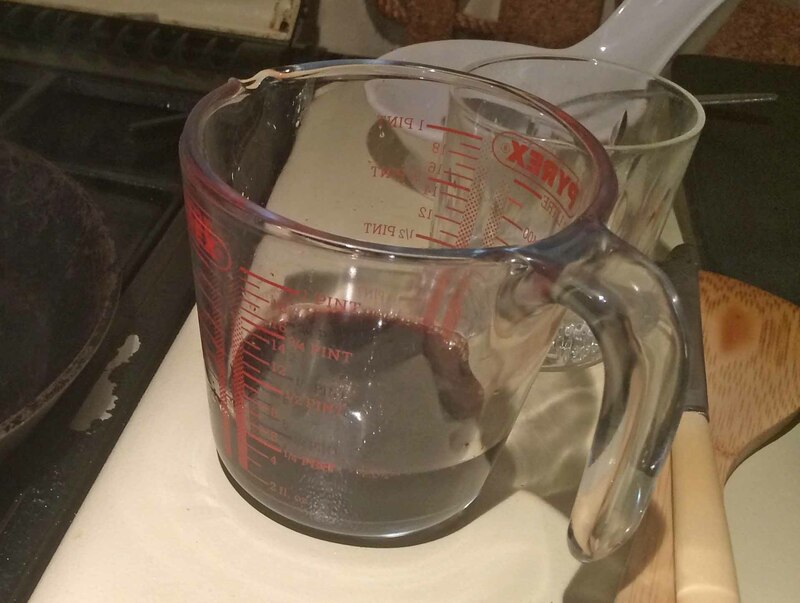 Put the balsamic vinegar and wine into a jug or glass and have ready to hand. Sprinkle salt and pepper on a board or plate and press the steaks into it, coating both sides. Oil a heavy bottom pan and heat it up until it is very hot. 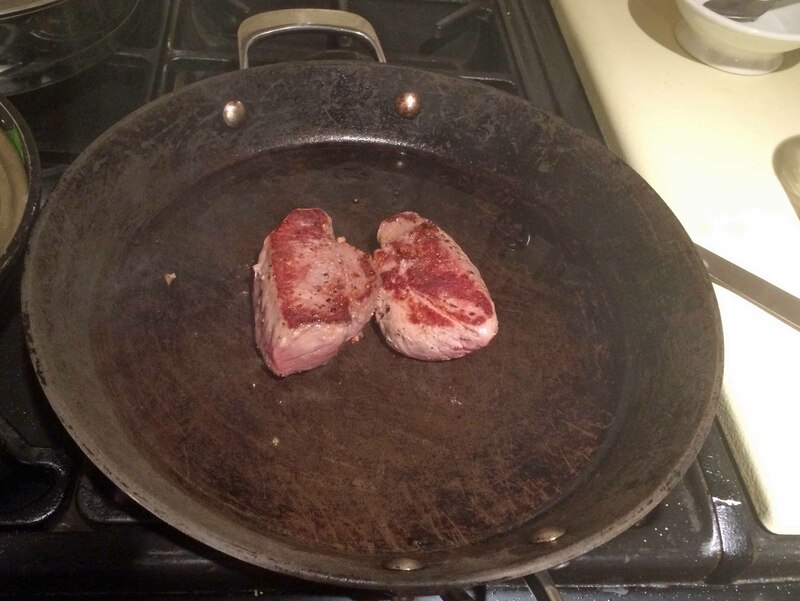 Sear the steaks at very high temperature. About 2 mins on each side for medium rare. Then take them out of the pan. Pour the wine/balsamic vinegar mixture into the hot pan. It will bubble fiercely. 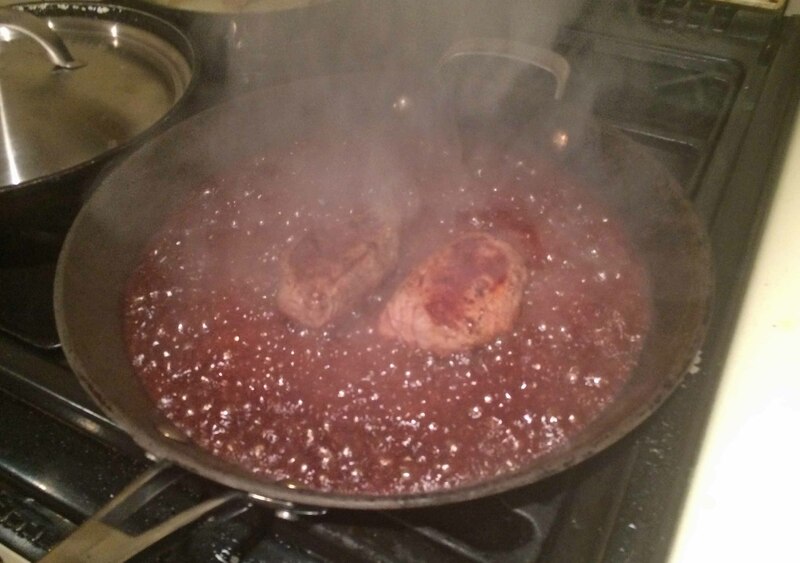 As soon as it begins to reduce to a thick, sticky syrup add the steaks back to the pan. Take out the steaks when they are nicely coated and set aside to rest for 5 minutes while you finish off the potatoes, reserving the remaining liquid for later. DonQui has learned that letting meat rest is very important, and very convenient. When cooking under high temperature the muscle fibres contract, as it rests the fibres relax and the meat continues cooking slowly resulting in an even tender pinkness rather than well done on the outside and blue in the middle. This also allows you to finish off the vegetable while the meat is resting and can be advantageous in all meat-vegetable combinations. Put some more olive oil in the potato pan then add the paprika/garlic mixture and stir it around for a couple of seconds. Add the potato slices and coat in the mixture. 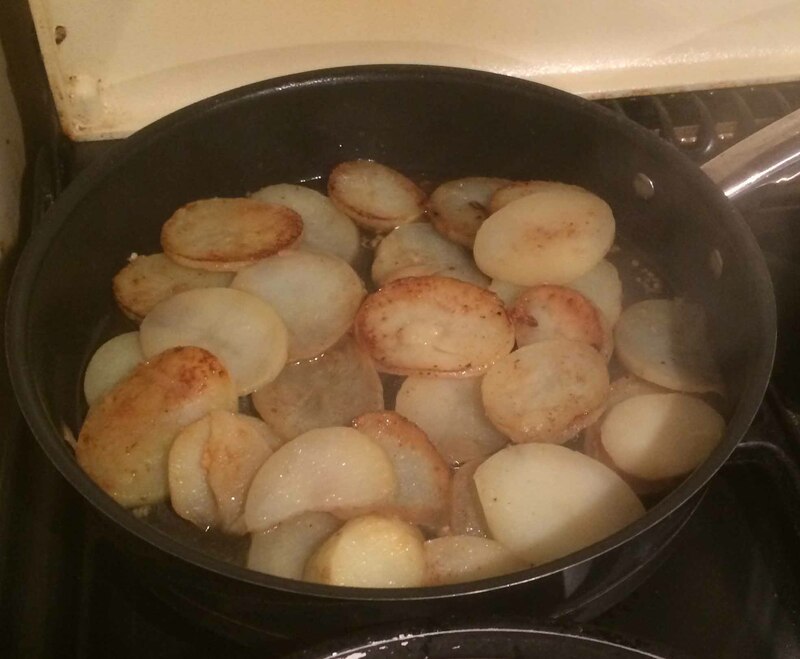 Throw in the bouillon and put the lid on the pan, letting the slices cook gently for about 3-5 minutes until the liquid is absorbed and the potatoes are done but still firm. 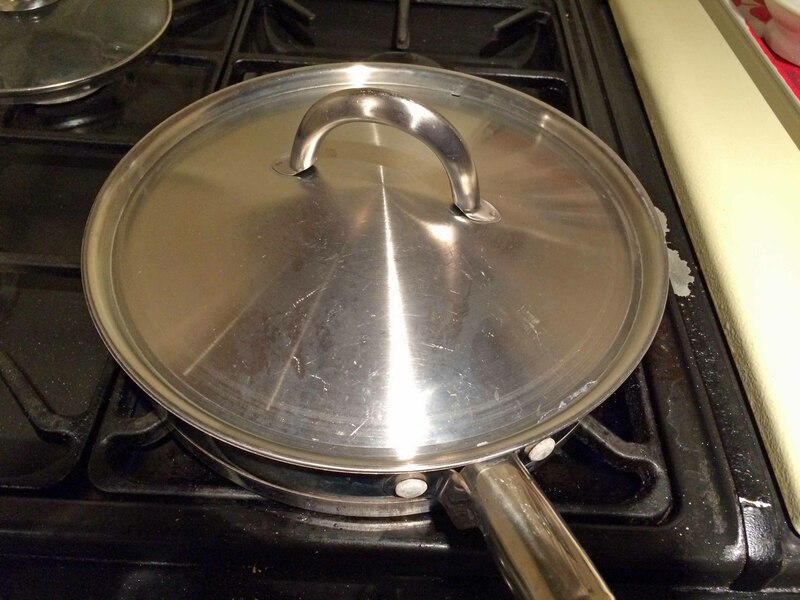 If there is still a little liquid left in the pan then take the lid off and let it cook a minute or two more until it is absorbed or evaporated. 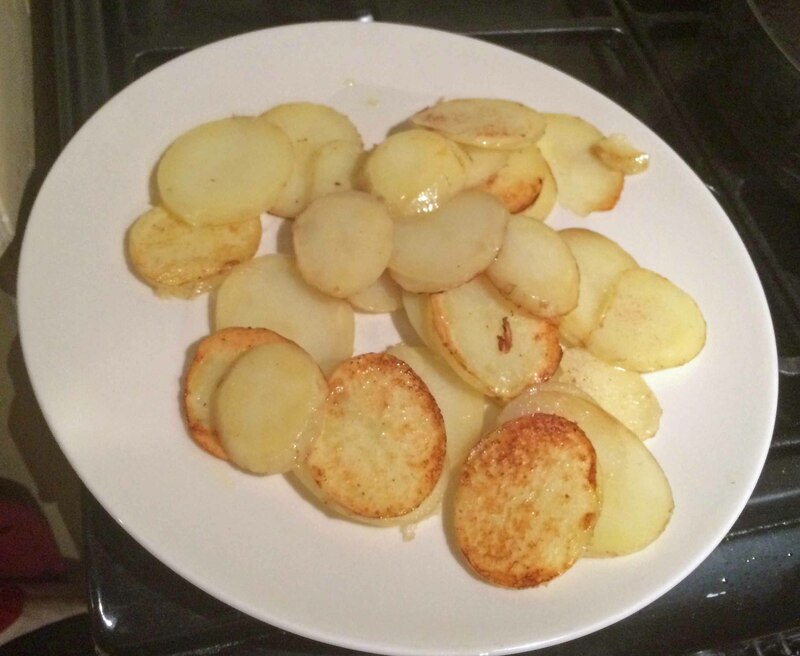 Arrange the potato slices on a serving dish. Place the steaks on top and garnish with the reserved wine/balsamic vinegar syrup and the pesto/olive oil mixture. Surround with your choice of vegetables. DonQui used beans, kale and cherry tomatoes from his allotment. He prepared the green vegetables by par boiling, setting aside and then warming up in butter at the last minute. He put the cherry tomatoes in the oven and warmed them up to the point that they opened up but not turned to mush. He thought that they added a nice splash of colour to the final dish. Indeed DonQui thought that it worked rather well. The potatoes were delicious and this coming from a donkey who is not overly fond of potatoes. He will cook them again this way in the future to accompany other dishes. The two part process lent itself rather well to finishing off as the meat was resting. The wild boar filet steaks were delicious but not quite up to the standard of Puerta Osario Restrobar. By the size of them DonQui is fairly certain that the steaks he had came from the larger end of the filet and were not quite as melt in your mouth wonderful. The ones he tasted at Puerta Osario were smaller and much more tender, suggesting that they came from the finer tail end. 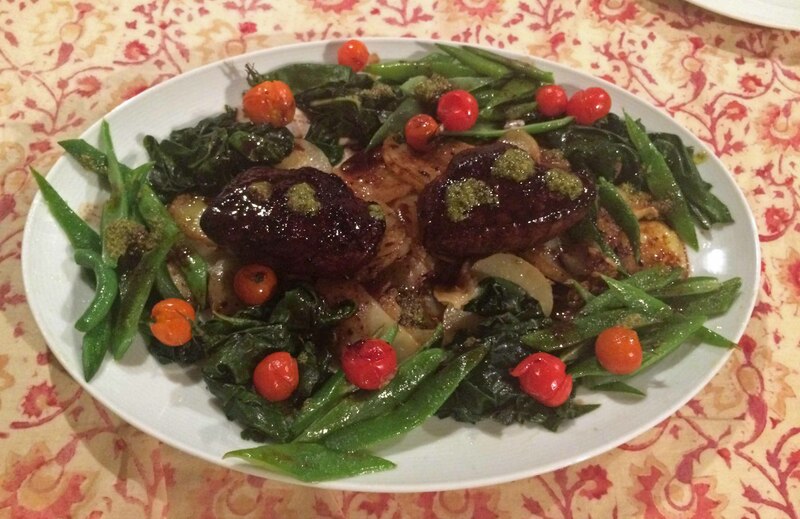 DonQui will try the recipe again with beef filet mignon. < Previous Strawberries in October?